The Swiss watch brand and the British automaker have joined forces to commission the "RM 11-03 McLaren Automatic Flyback Chronograph" wristwatch, presented at the Geneva International Motor Show (March 8-18, 2018). The watch boasts innovative specifications and a sleek, sporty design. It is a limited edition with just 500 pieces. 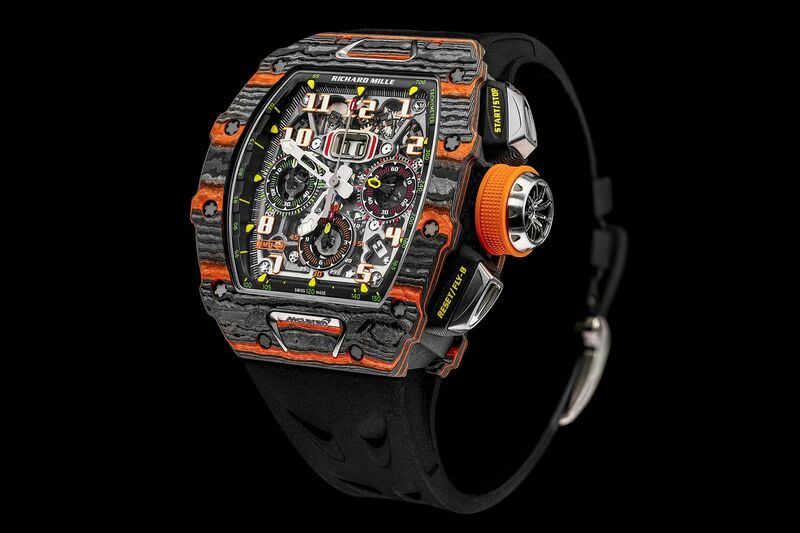 McLaren Design Director, Rob Melville, and Richard Mille Engineer, Fabrice Namura, pooled their talent and expertise to create the "RM 11-03," a wristwatch inspired by various details from the world of McLaren, in particular, its 720S supercar. The watch's titanium buttons, for example, evoke the headlights of this high-performance car, while the titanium crown is shaped like a wheel. The bezel's titanium inserts feature the McLaren logo. "The idea was to take on a real technical challenge, and come up with something other than a mere dial with an inscription, for example. I find the 720S designed by Rob Melville mesmerizing beautiful, and we wanted to give the RM 11-03 McLaren curves that were similarly both aesthetic and functional," explains Fabrice Namura. Other specs include a Carbone TPT and orange Quartz TPT case, matching high-resistance materials with the British car maker's signature color. The sapphire dial has an anti-glare finish and features three counters, an oversized date window and a month display window. The watch uses the RMAC3 caliber, an automatic skeleton movement with hours, minutes, seconds, flyback chronograph, 60-minute countdown counter, 12-hour chronograph and a variable geometry rotor. It has a power reserve of 55 hours. Only 500 limited-edition "RM 11-03 McLaren Automatic Flyback Chronograph" watches will be released, with priority purchase for owners of McLaren Ultimate Series supercars (the "McLaren P1," the "McLaren P1 GTR" and the "McLaren Senna").